These are perfect for Heroscape! They are even the same color as Marvelscape bases! And at $10 for 50, that is like 20 cents a piece! Just remember to create a US account to get US prices and shipping rates. And here's a great way to get some base stickers to go on those bases! And some tips on rebasing! How did you do that? Does Batman really have super-powers? Last edited by IAmBatman; April 27th, 2010 at 09:52 PM. I love birdies and butterflies and rainbows and unicorns and glitter. EDIT: It was badgermaniac who found the previous one. I googled it, found this site and found the three options I ordered. Last edited by Spidey'tilIDie; August 5th, 2009 at 01:26 AM. Spidey... you are awesome! I've been looking for the perfect base. - the exact same diameter as a heroscape base? - do they have that beveled edge (the slope, not really that important)? - are they the same height as a heroscape base? - you've already indicated that they are the same color as Marvel. 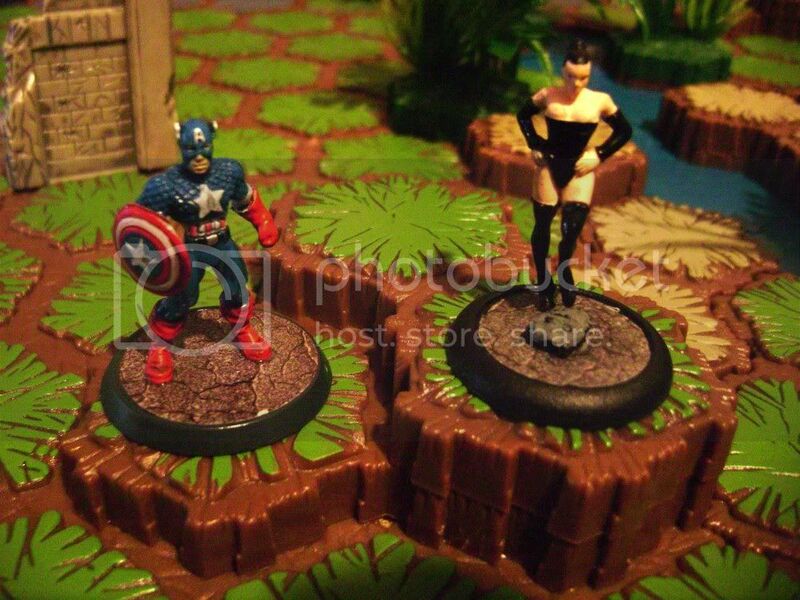 In other words, if I'm going to chop up all my Heroclix, I want to get a base that is almost identical to Heroscape in that it will take on the Grey Owl labels and will fit in a ladder. I will check tonight and post here. I have posted to the other forum on here for Heroscape Customs, but if you know anywhere else this might be good news, please pass it on! Last edited by Spidey'tilIDie; September 24th, 2015 at 11:49 PM. Wow, these would be great if they work out. Especially being that the price is right! And Matt_Helm asked everything I want to know, so all my questions should be covered. Thanks in advance for posting pics, Spidey! As well as for posting the info. What I would like to know is how they compare to the ones I posted in a thread a week or two ago. Most notably, is the following. The ones I posted are the correct thickness to work on ladders, and their diameter is identical. However, there is a slightly different curvature on the edge, which results in a slightly smaller sticker diameter on the top and makes for a slightly larger "black edge". Here is my comparison photo of my custom Warrior Woman for a better look. You can see the slightly different edge style. From the pics on the vendor site you provided, it is hard to see those kinds of details, so if you could fill us in, that would be great. Thanks badger, I actually ordered these with some of those and they are the same size, but the new ones have the same 45 degree angle and really no lip on them. I have not checked the width, but I plan to. Last edited by Spidey'tilIDie; August 5th, 2009 at 12:34 AM. Ok, I will try to post a pic tomorrow, but here is the rundown. the Base I found is slightly smaller than Heroscape base, but slightly larger than the Dark Ages base badger uses. It does have the 45 degree sides and also has holes underneath that can be punched out or drilled out, not sure which, ala Heroscape. Base is shorter whereas base badger found is same width. Sticker size looks exactly the same. And it actually falls between the two sticker sizes on GreyOwl's tools. I actually got a third base which may turn out to be the best one. But I will report on it tomorrow. For the record, the DA bases are exactly 30mm diameter. Official HS bases are 33mm. What is interesting is that I had thought I had measured HS bases to be 30mm as well (must have been a quick measure). Based on that, I would be surprised to find an exact match as 33mm would seem to be a very odd size to make bases for. No, I agree. After receiving them and placing them next to HS base they are about 2 mm shorter in Diameter (by eyeballing.) Best way I can describe them is like the top of the Heroscape base, but minus the bevel on top and bottom. Hold your HS base sideways and you will notice a slight lip on bottom that either curves in or rounds down, this is absent from these Elfball bases. But in the positive, top is so close to the same size, naked eye can't tell the difference and price is cheaper, not to mention has supported holes to drill out for glueing in Horrorsclix or Heroclix figs. Plus minus the lip on top, a little super glue keeps the sticker from ever pulling off. Hey, if we all agree on some good bases I can modify my sticker sheets to add a size made specifically for them. Maybe if someone could take good quality, well-lit pictures of the 2 candidates along side an official one, from several angles, we could vote on it and make it "standard"?